Monogamous and territorial, great horned owls are fiercely protective of their young. The great horned owl is overlord of a magical kingdom. From its perch, it surveys the realm of the firefly and the whippoorwill, the scurrying mouse and the sleeping squirrel. It sits atop the nighttime food chain, dining on creatures ranging from small rodents and birds to rabbits and raccoons. Except during migration, few bird species are active at night, but many other creatures are (a third of vertebrates and almost two-thirds of invertebrates), and the great horned owl is wonderfully adapted for this happy fact of nighttime predation. Thanks to relatively short, wide wings with soft-edge feathers, it flies silently, despite its great size. Its binocular vision, adapted for low light, is nothing short of a marvel. If our eyes were proportionately as large, they would be the size of grapefruits, and its neck, which contains fourteen vertebrae to our seven, allows its head to turn 270 degrees. The bird's hearing is just as good, allowing it to detect rustling under leaves or in underground burrows, with offset ears that allow for aural triangulation. All in all, this is a deadly, silent stalker. The great gray owl is larger, and the snowy owl is heavier, but the great horned owl, Bubo virginianus (it was first observed in the colony of Virginia), is a formidable creature. It stands two feet tall, weighs three to four pounds and can have a five-foot wingspan, with the female slightly larger than the male. Its yellow eyes and short black bill are set in a round face in a large head with feather-tuft "horns." Its body is a mottled gray and brown with barred feathers – black and brown on white – on the chest and belly. Its legs and large, powerful feet are feathered as well. They are widely distributed throughout the Americas, from the boreal forests of Alaska to the plains of Patagonia. Highly adaptable, they inhabit coniferous and mixed forests, prairies, deserts, tundra and swamps, although their preferred habitat is the one we find them in here in the Palmetto State – a mix of forest and field, just like their daytime counterpart, the red-tailed hawk. Description: Twenty-four inches long, with up to a sixty-inch wingspan; color is mottled gray and brown. Range and Habitat: Northern Alaska to southern South America. Throughout South Carolina, including some urban areas and the barrier islands. Reproduction: Mating behavior begins in fall. Two to three dull white eggs, approximately two inches long. Viewing Tips: Listen for deep stuttering hoot and for crows and jays mobbing them during the day. 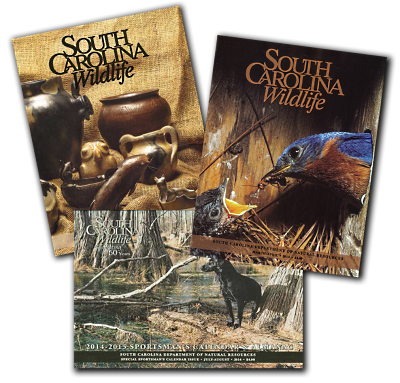 "They are found throughout South Carolina," says James D. Elliott Jr., founder and executive director of the Avian Conservation Center in Awendaw. "The only exception is where there is a lack of suitable habitat, i.e., wooded areas of suitable size. They are found in urban settings as well as our barrier islands." Most of us hear them more often than we see them, with that deep stuttering whooo alerting us to their presence. The female's call, generally heard only during courtship, is higher pitched and less elaborate than the male's. Spotting them in the daytime takes sharp eyes, for their coloring helps them blend in, and their tufts break up their silhouettes. Monogamous and territorial, great horned owls are fiercely protective of their young, who are born in winter following mating behavior that begins in the fall. They do not build their own nests, instead using those of other large birds – like hawks, crows or herons – as well as tree cavities or rock crevices. The male selects the site and leads the female to it. The two may roost nearby for weeks before she begins laying eggs. They may line the nest floor with bark, leaves, fur or feathers from prey or feathers plucked from their own breasts. The female lays two or three (three to four in the Midwest and West) two-inch, dull white, nearly round eggs as early as January, rarely moving from the nest as she incubates. The male brings food for the four to five weeks she is on the eggs. The young hatch with closed eyes and pink skin with just a little down. The male feeds them and the mother until the young are two weeks old, when the mother can leave the nest now and then. At six weeks, they have developed enough to walk onto nearby branches and take their first tentative flights. At this point they are called "branchers" and are, says Elliott, "often mistaken for orphaned or injured young birds. The adults continue to feed and care for them through this period and sometimes associate with the young birds for months." Adults are fierce in protecting them and will go after any perceived threat, including humans. "Females have been known to utter 'chuckling' sounds when disturbed or when defending the nest," says Elliott, "and males make a sort of 'growl' sound when confronting an enemy." Still, foxes, raccoons or crows may go after eggs or nestlings, and coyotes and feral cats can be threats. At ten to twelve weeks, the young are strong enough for confident flights, and once they are on their own, the parents will go back to their solitary ways. 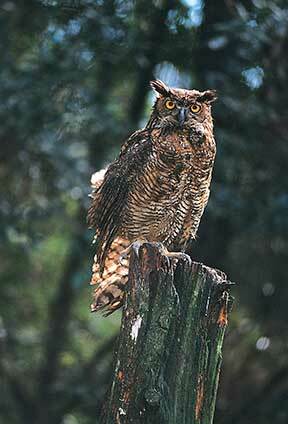 The great horned owl's diet, says Elliott, "is so diverse and extensive that it is hard to accurately describe. Like most raptors, they are opportunists. They are capable of taking larger prey than mice and rats but generally select prey that are safer to encounter. They will, however, take squirrels and rabbits if abundant and/or convenient." They have been known to eat creatures as large as groundhogs, possums and raccoons, and they are the only avian killers of skunks. They may eat insects, fish, snakes, amphibians and many kinds of birds, and they have been known to eat cats and small dogs. Smaller prey they swallow whole, regurgitating castings or pellets of bone and other non-digestible bits six to ten hours after eating. "They will carry prey to a perch at times," says Elliott. "They may also eat on the ground if the kill is too large, although this is generally considered a more vulnerable approach and is avoided when possible." While they are at the top of the food chain, they are susceptible to any number of human-related dangers. "We see a wide range of impacts on great horned owls," [at the center's clinic] says Elliott. "They are often hit by cars, they get snared in soccer nets, electrocuted on power lines and, unfortunately, we still see gunshot owls." Then there are environmental hazards. A study published last year by the center found elevated levels of environmental contaminants in birds of prey, "but particularly in great horned owls," says Elliott. Still, they are at this point plentiful, and we would do well to appreciate the reverence they have inspired through the millennia. Their ponderous gaze, imperial movements, and utter silence in flight all make the great horned owl a mesmerizing creature. In reality, and in our imagination, they will continue to rule over the world to which we have assigned so much magic, bearing all the serenity and wonder of the night. Rob Simbeck is a freelance writer living near Nashville, Tennessee.